Want to enhance your persuasive public speaking skills? Perhaps you have already spoken before an audience, have given a great speech, have influenced them considerably to your point and have received a standing ovation a few times. 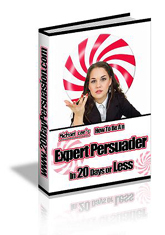 Now you wish to improve that foundation you have in persuasive public speaking. Here are three ways that can help you to become a more influential speaker. One, body language. Majority of human communication is done nonverbally, and people commonly respond and understand it very well, having said that we primarily did not have formal education on nonverbal language. In order to effectively connect with your audience, mean what you're saying through nonverbal cues. These include eye contact, hand gestures, pacing and the like to stress your words and statements. For instance, if you're trying to imply a very important point, you may point a finger up. If you're telling a story, pace a short distance citing you're bringing them to a certain point. You would be surprised what difference as an audience it would make if the speaker simply went through his speech purely verbal. Two, study. Influence is your main concern when speaking before an audience so you have to know what you're talking about. You have to persuade them into considering the point that you're trying to make by citing facts, accepted truths and sources to show that your speech is actually based on something relevant. Realize that there is no debate or an exchange between you and them so you have to be very mindful of every single aspect of your speech or they may find you stereotypical; or worse, they may see you contradicting your own statements. Do some research and be open about new ideas and opinions before speaking; this will further guide you how to be a more persuasive speaker. Three, connection. Treat your audience, no matter how great or small in number, as your utmost concern. They are the reason you are speaking, so feel for them as if your message and efforts will be in vain if you cannot convince them to your point of view. You have to create a link between you and your audience to successfully deliver your speech. This connection can be made through personal anecdotes, humor or even asking an audience to speak a little. The goal is to be able to create feelings between you and your audience where they will know that it matters to you that they listen. This will be the basis for a smooth flow for the duration of the speech and probably the key to persuasion. In a persuasive speech, you as the public speaker should know how to persuade and convince. The audience should be driven to a point of influence that your message will successfully be delivered and received. Repetition of ideas, facts and opinions will bring them to your point and positively boost your persuasive public speaking skills.